Foelix, Rainer F. 1996. 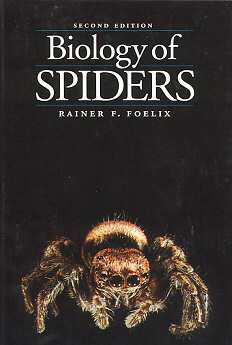 Biology of Spiders, Second edition.Oxford University Press, New York. Paperback. 330 pages. If spiders are your thing, then this is your book. Written by the Director of the Natural History Museum in Aargau, Switzerland and first published in 1979, Biology of Spiders is a complete textbook on spiders.This is the only book on spiders that I have and probably the only one I will ever need. It is full of excellent black and white drawing and incredible photographs (no color) on almost every page. The text covers every aspect of arachnology including systematics, evolution, anatomy, metabolism, neurobiology, spider webs, life histories of many species, and much more. Written at a fairly high level, the technical vocabulary may require an effort to read. There are frequent references to the literature but the text is captivating, fluent, and aimed at the general reader rather than the specialist. Also included is a complete bibliography of the current arachnological literature.